Technology has eliminated lots of low skill and medium skill jobs in the U.S. Globalization has made it less expensive for low skill jobs to be performed in the developing world at lower cost than in the U.S.
At the same time as jobs were being replaced by technology and disappearing overseas, millions of women entered the labor force. A new wave of Hispanic immigration has caused even more competition for low skilled jobs. In addition, stagnant wages for the low skilled and medium skilled worker have been accompanied by an increase in private debt through the advent of credit cards and subprime mortgage borrowing. This enormous increase of consumer debt led to the housing bubble, its bursting in 2007-2008, and the resulting Great Recession. Five years after the end of the recession in June 2009, we still have an enormous mess on our hands: a stagnant economy, high unemployment, massive and increasing debt and a fractious political process. How in the world are we going to come together to address our perilous situation in a rational and timely manner? Mr. Wolff believes that capitalism’s faults are too severe to be fixed with regulatory tweaks. He also agrees that socialism has proven to be unsuccessful where it has been tried. He proposes a new economic system of “Workers’ Self-Directed Enterprises” as an alternative. I agree with Mr. Wolff that capitalism is in a crisis but I think that it can be repaired from within. The challenge is to simultaneously give our economy a sufficient boost to put millions of people back to work and to do this while dramatically shrinking our annual deficits in order to get our massive debt on a downward trajectory as a percent of GDP. How to do this is the main focus of my blog, day in and day out! Last week’s report from the Congressional Budget Office “The Economic Outlook: 2014 – 2024” (which I discussed in my last post) caused a big stir with its prediction that ObamaCare will cause a loss of 2,000,000 mostly low wage jobs by 2017 and 2,500,000 such jobs by 2024. The lost jobs aren’t necessarily from workers being fired or fewer workers being hired but rather the overall decreased incentive for individuals to find work. The CBO analysis is based on the research of the economist Casey Mulligan featured in yesterday’s Wall Street Journal as “The Economist Who Exposed ObamaCare”. The above chart of Mr. Mulligan interprets several recent government subsidy programs as a new marginal tax rate, i.e. the “extra taxes paid and government benefits foregone as a result of earning an extra dollar of income.” The 2009 stimulus, the Recovery and Reinvestment Act, had an effect like this but it was temporary. 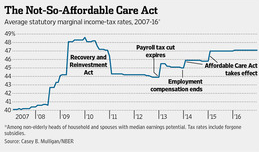 The marginal tax increase of the Affordable Care Act will last as long as it remains in effect. The above chart from the same CBO report, showing the steady decline in the Labor Force Participation Rate from the year 2000 onward, demonstrates the critical nature of this problem. Lower labor force participation means lower growth in overall labor productivity which in turn means slower economic growth. Since the Great Recession ended in June 2009, GDP growth has averaged only about 2% annually. Slow GDP growth means, in addition to a higher unemployment rate, that America’s standard of living will not increase very rapidly if at all. But the problem is really much worse than this. We have an enormous debt problem which is only getting worse every year that we continue to have large deficits. The CBO report predicts increasing growth in the size of our national debt. By far the least painful way of shrinking our debt (relative to the size of the economy) is to grow the economy as fast as we reasonably can. But our economy is actually slowing down, not speeding up! This is a very serious problem which many of our national leaders are much too complacent about! The Congressional Budget Office has just issued the report ”The Budget and Economic Outlook: 2014 to 2024”, giving its usual objective and nonpartisan look at our prospects for the next ten years. My purpose today is to give a simple interpretation of its basic data. In my next post I will address the implications of this interpretation. The first chart above shows a forty year history of government deficit spending. The average deficit for this time period is 3% of GDP. From 1982 – 1987 the deficits were worse than this and from 2009 – 2013 they were much worse. The real problem is the accumulated deficits, i.e. the debt. The second chart above shows the public debt (what we pay interest on) all the way back to 1940 as a percent of GDP. As recently as 2008, the public debt was below 40% of GDP. Now it is 73% and climbing. This is very serious for two reasons. Right now our public debt is almost free money because interest rates are so low. But when interest rates return to their normal level of about 5%, interest payments will explode and be a huge drain on the economy. In addition, these CBO predictions assume continued steady growth of the economy. If and when we have a new recession or some other financial crisis, there will be much less flexibility available for dealing with it. Now look at the last two charts. The first one shows the rate of GDP growth since 2000 which has averaged about 2% since the end of the recession in June 2009 and is projected by the CBO to level off at this same rate over the next 10 years. This is an historically low rate of growth for our economy. The final chart shows the gradual decrease of the labor force participation rate over this same time period. These two graphs are related! When fewer people are working, the economy simply will not grow as fast. High debt and slow growth are big problems for an economy. We’re falling more deeply into this perilous state of affairs all the time. We need to take strong measures to break out of this dangerous trap! On the eve of the President’s State of the Union address, the New York Times gives an answer to this question in today’s paper, “Obama’s Puzzle: Economy Rarely Better, Approval Rarely Worse”. The charts below do show the basic trends all moving in the right direction. But is this good enough? The unemployment rate is moving steadily downward but it is still a high 6.7% almost five years after the recession ended in June 2009. And this is with a labor participation rate of only 58.6%, which is historically very low. The budget deficit is dropping but is still unsustainably high. In the five years, 2009 – 2013, deficits have totaled $6 trillion dollars. As soon as interest rates return to their historical average of 5%, interest on this $6 trillion in new debt alone will total $300 billion per year, forever! Furthermore, the Congressional Budget Office, the most credible source of budget information, predicts that the deficit is likely to resume an inexorable climb within a few years as baby boomers retire in ever greater numbers, rapidly driving up entitlement costs. Economic growth was stronger than expected in the last quarter of 2013 and this is a good sign. But it has averaged only about 2% since the recession ended which is very low by historical standards, in a post recessionary period. The point is, do we really need to settle for such mediocre performance: a stagnant economy, high unemployment and massively accumulating debt? Should we just declare that in a highly competitive global economy with an ever higher premium on information and technology, that we just can’t do any better than we already are? Isn’t there some way to make our economy grow faster in order to provide more and higher paying jobs? I think that the answer to this last question is an emphatic yes! In fact, this is what my blog is all about. Just read some of the other recent posts and let me know if you disagree with what I am saying! 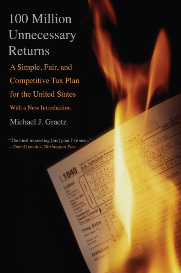 The Yale Tax Law Professor, Michael Graetz, has proposed a new tax system “100 Million Unnecessary Returns: A Simple, Fair, and Competitive Tax Plan for the United States” which would do wonders towards straightening out the huge fiscal and economic problems now facing our country. A broad based Value Added Tax of about 14% is enacted on goods and services. The U.S. is the only advanced economy without a VAT. Families earning less than $100,000 are exempted from the income tax. For incomes between $100,000 and $250,000, the tax rate would be 15%. For income over $250,000, the rate would be 25%. The corporate income tax rate is lowered to 15%. The Earned Income Tax Credit (EITC) is used to provide relief from the VAT burden to low-income families by using payroll tax offsets. The plan is designed to be revenue neutral as verified by the Tax Policy Center. Taxing consumption and lowering the corporate tax rate to 15% from its current level of 35% would dramatically encourage investment in the U.S. thereby stimulating the economy and creating both new jobs and higher wages for American workers. It would eliminate more than 100 million of the 140 million U.S. tax returns. With many fewer Americans paying income taxes there would be far less temptation for Congress to use income tax exclusions, deductions and credits to try to address social and economic problems. The plan retains all of the progressive features of our current tax system whereby higher income earners pay higher tax rates. The point of describing the Graetz Plan in some detail is not to suggest that it is the best way to implement tax reform but rather that here, at least, is one attractive way to do it. The purpose is to move the discussion forward. We badly need to make changes along these lines! I have been writing this blog for just over a year. It addresses what I consider to be the two biggest problems faced by our country at the present time. First is our enormous national debt, now over $17 trillion, and the huge annual budget deficits which are continuing to make it worse. The second problem, of equal magnitude, is our slow rate of economic growth, about 2% of GDP annually, ever since the Great Recession ended in June 2009. These two problems are closely related. If the economy grew faster, federal tax revenue would grow faster and the annual deficit would shrink faster. Not to mention that a faster growing economy would create more jobs and lower the unemployment rate, which is still a high 7%. The impediments to solving these problems are huge. Our public debt, on which we pay interest, is now over $12 trillion or 73% of GDP. Although it may stabilize at this level for a few years, it will soon begin climbing much higher, without major changes in current policy. This is primarily because of exploding entitlement spending for retirees (Social Security and Medicare) who will increase in number from about 50 million today to over 70 million in just 20 years. As interest rates return to normal higher levels, just paying interest on the national debt will become, all by itself, a larger and larger drain on the economy. The impediments to faster economic growth are increasing global competition, such as inexpensive foreign labor, as well as rapid advances in technology, such as electronics and robotics. Both of these trends reduce the need for unskilled workers in America which in turn holds down wages and slows down economic growth. At the same time we have an antiquated tax code to raise the huge sums of money necessary to pay for a large and complex national government. It worked fine through the post-World War II period, as long as the U.S. had the dominant world economy with little significant competition from others. But this situation no longer exists. We now have a tax system which doesn’t raise enough money to pay our bills and at the same time is so progressive that the highest rates (39.6% on individuals and 35% for corporations) are not sufficiently competitive with other countries. This discourages the entrepreneurship and business investment we need to grow the economy faster and create more jobs. We have an enormous problem on our hands! Is it possible to fundamentally change our tax system to turn things around? My next post will answer this question in the affirmative! The parallels and analogies between what has happened in Detroit and what is now happening in the U.S. are striking. The U.S. has had huge annual deficits for five years in a row and the accumulated debt is enormous, the Federal Reserve is holding interest rates down to make borrowing cheaper, and our country’s infrastructure is deteriorating much faster than it is being repaired. Right now interest on the national debt is small ($223 billion in 2013, or 8% of federal revenues). But interest rates will inevitably return before long to their average historical rate of about 5%. Right now the public debt (on which we pay interest) is just over $12 trillion. This means that in the near future interest on the national debt will be at least $600 billion per year and probably much larger because the debt is still growing so rapidly. This will take a huge bite out of revenue and leave far less of it for other purposes. This problem will continue to exist even if the budget were to be miraculously balanced from now on but it would at least lessen over time as the economy continues to grow. Without budget restraint the problem will never go away and will be a perpetual drag on our national welfare. This is, of course, exactly the condition in which Detroit finds itself at the present time. Detroit has the option to declare bankruptcy and make its creditors and pensioners take big losses. Once it does this it can make a fresh start and perhaps recover its former status. But are we prepared to let the whole country suffer a similar fate? The consequences would be enormous. If the U.S. goes down, the whole western world could come down with it. Democracy and human progress would be severely threatened. This is really too terrible a tragedy to even contemplate. Let’s turn things around before they get any worse!